Panthers second round pick (33rd overall) Rocco Grimaldi shakes hands with Panthers owner Cliff Viner following his selection Saturday in Minnesota. 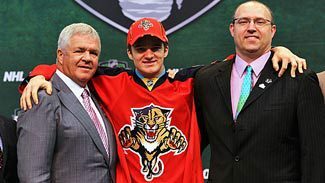 The Panthers opened up the 2011 NHL Draft on Friday by grabbing St John center/winger Jonathan Huberdeau with the third overall selection and then swung a deal to acquire defenseman Brian Campbell from Chicago for left winger Rostislav Olesz late in the day. On Saturday they were busy adding to their prospect cupboards, adding both size and skill as they went for a blend in their athletes in selecting nine draft picks while adding a 2012 3rd round pick to their stables. "Our mantra going into the draft this year is skill," said Panthers GM Dale Tallon who ended up selecting seven forwards and three defensemen overall. Their heights ranged from 5'6-6'3. "We looked at our depth chart and we didn't have a lot of skill throughout. This year the deal was let's get as much skill as we possibly can get with speed and character as well. It was a good draft for us because we got a nice diverse group." "We still got a lot of guys in that mid-range area (second-third rounders) that we really value," said Panthers Director of Scouting Scott Luce. "We thought there was a lot of depth in that area and we went forward with it and I thought the draft plan was executed really well. "We wanted character, skill, some speed and the size was probably the last preresiquite for this year because we feel we got good size moving forward." Florida opened their day by selecting US Development center Rocco Grimaldi. The center ranked, No. 32 overall by Central Scouting, lit up the USHL this season posting 12 goals and 13 assists for 25 points in 23 games. For Tallon, it was like getting a second first round pick with the addition of Grimaldi. "Every tournament we saw him play in this year, he was just dominant," said Tallon. "He played great. He was as good as anybody or better than anybody in those tournaments." "Much shorter (wait) than yesterday, that's for sure," said Grimaldi. "I knew it was a new day. I knew wherever I was drafted to was where the lord was going to put me. I'm happy to be a Florida Panther." Born in Anaheim, California, he has been able to put up outstanding numbers despite being small in stature (5'6", 163 lbs). "I expect to win anywhere I go and I'm going to work hard to do that," said Grimaldi. "I try to bring speed and skill to the team." "You always look at the size but you see a lot of great players in the NHL that are 5'6", 5'7"," said Tallon. "He was so dominant in all these tournaments against all these other guys that were all rated higher than him that were bigger than him." "Rocco is a special, special hockey player as far as his competitiveness, his desire to win," said Luce. "You take away his lack of size and he would be a very complete hockey player. He's got good skating ability, great offensive instincts. The thing about Rocco is that in today's game, he's very tough to play against because of the lack of size also becomes an asset for him." In a meeting with the Panthers on Thursday night, Panthers GM Dale Tallon told Saint John center/winger Jonathan Huberdeau that he was there guy as long as the draft fell as it was expected. Grimaldi will take his talents to college where he'll suit up for North Dakota and play alongside Panthers prospect and junior Corban Knight (2009 fifth round pick - 135th overall). The Panthers set to pick at 47th ended up moving back in a trade with San Jose. The Cats picked up the 59th selection and a 2012 third round pick. With the 59th selection, they used it on Rasmus Bengtsson, a defenseman that played for Rogle in the Swedish-2 league. "Big left-shot D'. We have a couple of guys that are first year pros that are left shot but we don't have that depth in the system there," said Luce. "Rasmus was a very underrated guy in regards to he's going to provide secondary offense but he's going to be a shut down guy and a transitional guy." With four selections in the third round, the Panthers were quite busy in selecting three forwards and a defenseman. They opened up their third round picks by taking Pittsburgh, Pennsylvania native Vincent Trocheck. "I had a little feeling before the draft (about being drafted there). I had a couple of meetings with them. I was just hoping they would pick me up there and words really can't describe the feelings," said Trocheck who posted 62 points (26 goals) in 68 games for Saginaw of the Ontario Hockey League. "You can expect a lot of hard work and I'm going to make the most out of the opportunity that they give me." "Character guy," said Luce. "Very close to his family. He stepped outside the box and went and played in Michigan from Pennsylvania at a young age. This guy wants to be a hockey player." With the 76th pick, the Panthers selected right wing Logan Shaw. "I'm extremely excited. They were the team I was actually looking forward to going to," said Shaw. "I met with the organization a couple of times and I was pretty excited coming to the draft and I was hoping to go to a team like Florida." "Logan's a type of guy on the right side, we're looking for a little bit of size on the right side and he's got good finishing touch," said Luce. "He's a late '92 so he's got one year before he can potentially turn pro. He's going to go back and put on some upper body strength. He's a skilled guy with size." The Glace Bay, Nova Scotia native led Cape Breton in goals (26) and points (46) on a not so strong team (18 wins on the season). Despite being from far east Canada, he has had ties to the Panthers so to speak. "It was the very first jersey (Panthers jersey) that I wore as a kid," said Shaw. "My mom bought it for me as a little baby. It's a nice jersey. Florida was a good team to watch." The Panthers turned to the defensive end with their third third-rounder and tapped Jonathan Racine, a 6'1", 182 left-handed shot from Montreal, Quebec. "I was nervous for my family but I'm happy to be with the Panthers, a good young organization," said Racine who posted seven points (two goals) in 68 games for Shawinigan of the QMJHL. "I'm a defensive defenseman. I think I make a good first pass." With their fourth and final third round pick, they got the crowd involved as they took Kyle Rau, a center from Eden Prairie. The future Minnesota Gopher was the Panthers second straight pickup of Mr. Hockey after posting 70 points (33 goals) in just 25 games. "It can't get any better getting drafted 20 minutes away from your house. It's unbelievable," said Rau who netted the triple overtime winner to give Eden Prairie a state championship at the Xcel Energy Center a couple of months back. "This past year has been amazing and this has capped it off." "Kyle came to us very highly recommendated from our off ice due diligence," said Luce. "Everyone we spoke to spoke very highly of this guy. His training and his lower body strength is very comparable to a lot of NHL forwards that lack height." "We saw a lot of video on him, a lot of good quality viewings and he came here for an interview. Doesn't speak English at all so he's got to learn that but we think we have got a guy there with his size and sill set that he's just got to polish things up a little bit," said Luce. "As a mid round guy, he's got time to develop that." In the sixth round, the Panthers went back to the Minnesota High Schools to select defenseman Edward Wittchow. At 6'3", 189 lbs Witcchow recorded 23 points (nine goals) in 25 games played for Burnsville. He'll be off to Wichita of the USHL next season. "It's crazy. Looking back at the start of the season I didn't think it would come to this just not being a well known name especially in the NHL world. Things picked up towards Christmas and I started to play a lot more physical and had a consistent season," said Wittchow. "Things just picked up and I became one of the luckiest Minnesotans to be even thought about for the draft and got lucky enough to be drafted." With their final pick, Florida chose right winger Iiro Pakarinen from Finland. The 19-year old has played for Kalpa of the Finnish Elite League the last three seasons, posting 21 goals and 18 assists for 39 points in 122 games.